Starting a garbage bin and dumpster cleaning side business is an excellent way to have a consistent stream of revenue for your personal income. One thing all households have in common is that the occupants create some form of trash or waste. Whether these households own garbage cans or dumpsters, residents typically use these dispensers each day to clear their homes. 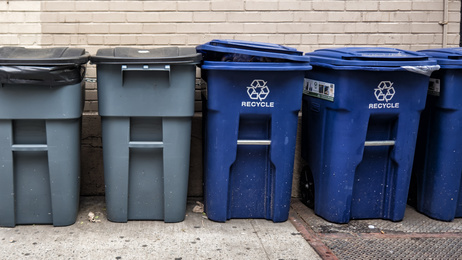 The daily use of these bins and dumpsters can result in the buildup of unpleasant smells, unsightly appearance, and unhealthy accumulation of bacteria. By offering a solution to this extremely common problem, you can quickly establish a thriving business. Effective planning is the first step to starting a successful garbage bin and dumpster cleaning business. While the regular use of trash cans ensures that you can have regular business, the sheer volume of opportunity can quickly overwhelm even the most seasoned entrepreneurs. Since American consumers dispose of over 250 billion tons of trash each year, it is easy to see the business potential in cleaning what is left behind. Writing down a solid business plan can help you organize your thoughts before investing money to launch the business. Important points to outline include the geographical range or radius of households or businesses you intend to serve, the operating hours you are available to work, and potential team members who can assist you with the business. You should also have a plan to comply with any local licensing or zoning laws for service-based businesses in your area. In addition to the business plan, another planning factor is the act of cleaning itself. Familiarize yourself with the most efficient ways to clean different types of waste dispensers. This can help save time as you gather materials needed later and reduce stress as you strive to serve each customer equally well. Test the easiest cleaning methods by practicing on your own garbage bins if possible, and time yourself to measure the quickest way to do a thorough cleaning job. Not only will this help you master the skill, but it can also provide excellent before-and-after photos you can use to market your business in the future. Starting a garbage bin and dumpster cleaning business requires a decent founding investment; however, the costs are generally lower than other waste management services. Moreover, the return on investment tends to be much higher. For one, you will need to register your business as a limited liability corporation (LLC) or other corporate structure. This reduces your personal obligation or risk as you handle waste materials, and it can simplify filing business taxes and paperwork. You will also need to invest in home business software to keep a roster of clients and maintain solid records for revenue and tax purposes. Depending on the size of the endeavor, most cleaning entrepreneurs invest in a work truck or van devoted solely for the business. A work truck or van gives the business mobility, keeps supplies organized and handy, and helps keep dirt and grime separate from your personal vehicle. The work truck is also a great way to keep an accurate record of business mileage for tax deductible purposes if applicable. While the work truck enables you to have a truly mobile cleaning business, keep in mind that any cleaning business also needs the right professional supplies. The cost of launching your cleaning business can cost several hundred to a few thousand dollars to set up the work vehicle, business registration, supplies, and marketing. In addition to tapping into savings, you may wish to open up a line of credit at your bank or apply for funding from a credit union to support your plans to run a cleaning business. In order to keeping your plan organized, you need a home office area with software installed. Since this business may require daily appointments and commutes, it is important to keep your clients numbered and organized as this business has the potential to grow rather quickly. Be sure you have designated a specific area for managing receipts as well as keeping track of all future business leads. Once you have arranged the home office area, the most important part of the cleaning business are the supplies. Essential supplies include large brushes, cleanser, and degreaser solution. You can generally buy these commercial supplies in bulk to save money in the long run. In addition, powdered cleaners are usually easier to store and transport, and these large boxed cleansers work particularly well on outside grime. Other supplies include deodorizer and disinfectant. A portable hose comes in handy for rinsing residue after your job, and you should also keep paper towels and rags available for any work job. Designating a storage closet or work shed for your cleaning supplies can help keep you organized and prevent spillage or loss of potency. To protect yourself on the job, be sure to keep a first-aid kit handy can safeguard against minor issues. You should also have work boots and large gloves for handling waste material. Some cleaning business owners invest in full-size uniforms, jumpers, or ponchos to protect their bodies as they work. If you go this route, consider getting your business logo printed on the uniform to promote your business at all times. Once you have determined your service area and collected supplies, it is time to launch the business. As local businesses, cleaning services benefit from flyers and business cards. Print flyers that highlight the benefits cleaning garbage bins and dumpsters, including eliminating odors, stopping the spread of germs, and removing threat of pests like spiders, flies, and maggots. Post flyers on local bulletin boards such as libraries or community centers. A cleaning service is also one of the few businesses that still benefit from concise cold-calling or drop-ins to speak with managers. By contacting the managers of apartment buildings, restaurants, or business lots, you can have a large number of customers quickly. Finally, you can advertise your business through free online listings such as Patch.com or Google Business. Garbage bin and dumpster cleaning businesses offer unlimited opportunities for local marketing. For example, cleaning side businesses are among the most appropriate for vehicle advertising. Have your business name and phone number painted in bold lettering on your work truck. Not only does this capture the attention of others during the morning commute, but it offers 24/7 advertising wherever you park you vehicle. You can also distribute business cards at any type of large gathering, including churches, bingo clubs, and park rest areas. The key is striking a chord with customers to show how they can benefit from your service. If possible, include before-and-after photos or testimonials to demonstrate how you improved the living condition of a home or business. Operating a garbage bin cleaning business requires both service organization and client management. For the service side, be sure to check your supplies regularly and review your purchase receipts. This ensures that your costs do not exceed your revenue and profit. If you use a work truck, schedule this vehicle for regular maintenance and cleaning to keep your business running smoothly. For the client component, maintain a working contact phone number and establish yourself as a reliable worker who does a professional job. Keeping your customer satisfied can help you in business for years. Few other businesses have such enormous potential for repeat customers. To capitalize on this, you can offer contract plans for your services. Not only does this provide you with a regular source of business, but it solves the customer problem without needed to remember to schedule regular appointments. A garbage bin cleaning business has nearly unlimited potential for growth. One of the simplest ways to pursue growth is through geographic expansion. Cleaning side businesses typically begin with the radius that is easy to handle (such as five square miles). You can gradually add a mile radius to your service area to increase potential customers. Another way to increase business growth is to pursue untapped resources. Getting a written contract with apartment complexes, strip malls, or business lots can provide numerous clients without needing to travel very far between sessions. To speed up cleaning sessions, you may wish to hire part-time or additional employees. Not only can teamwork result in a more thorough job, but each of these employees can wear the company logo and promote your business for years to come.